A young Italian friend (a confirmed city-dweller) once said to me, as we were trekking along the stony and inhospitable desert coast of Peru: “How stunning the Earth must have been before humans reshaped it!” Until then I had never considered how many areas of the planet had been totally redesigned and, through human activity, had lost their authenticity. It was that very desert that had attracted me as a child. Dozing against the window of the car as we travelled along the Panamerican Highway, I dreamed of walking toward the mountains and never stopping. It is still my dream. It would, however, be foolish to depict Peru as an untainted paradise. Peru does have much untouched, virgin land to inspire dreams and invite exploration. But it also has many landscapes that have been transformed with less-than-harmonious results. In this country opposite extremes are more obvious than anywhere else. Lima offers all the beauty and ugliness of a crowded metropolis; aggressive, chaotic, and stubbornly claiming to be modern. Yet not far away, you can breathe in the tranquillity of a mountain village still unaware that the 17th century ended a long time ago. The heavy machinery that builds roads here, there, and everywhere has to stop once in a while to give way to a shepherd and his flock, while nearby an indigenous matron shouts stridently, in Quechua, into her smart phone. On every city corner, the traffic light, trapped like a dragonfly in a web of indecipherable cables, glows red with rage, powerless, because none of the mototaxi drivers pays it the slightest heed. Technology has burst into Peru with no respect for an ancient world, setting in motion an unending chain of clashes. 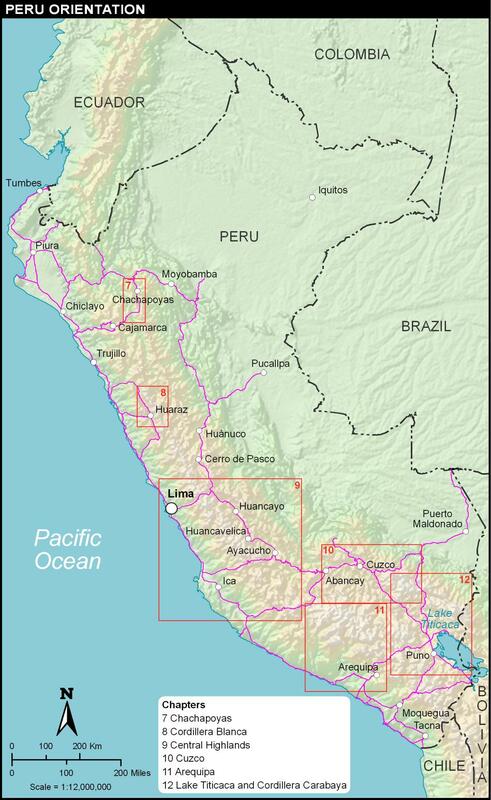 There is however the other Peru. Boundless, timeless, alien to the present, and eternal. The country of the driest desert, the richest sea with an abundance of fish and birds, the highest snowcapped peaks in the tropics, the idyllic countryside where people still work communal land with song and laughter, and the endless jungle that teems with life reverberating in every tree, every leaf, and every drop of water. This is the Peru that Robert and Daisy know so well, better than anyone, I would say. Their perseverance in accumulating a treasure-trove of knowledge step by step, through years of first-hand experience, research, and discovery, has given them an unmatched insight into this land. They haven’t simply travelled around the country; with their footsteps they have woven a vast carpet that, in these pages, they depict faithfully sharing all they have learned. And with what results! In addition to their knack for tracking down what really matters, they have an exceptional capacity for conveying it, giving detailed instructions for how to enjoy what they have experienced and relive it as if for the first time. I have had the good fortune and special privilege of trekking with them on several occasions, both on long difficult stretches and on easier walks of only a few hours. It is a pleasure to see how they complement and understand each other in all the tasks that outdoor adventure demands and it is even more remarkable when you realize that they have been doing this for a lifetime together! For an old grouch like me, who would rather be seen as the terrifying Yeti that no one dares approach, this is doubly admirable. Only those who love what they do have the patience and dedication to crisscross continents and record everything that they find along the way. And this, I believe, is what all of us who trek share. Who would take the time to paint a landscape when they could photograph it so much more easily? Only someone who loves to paint and wants to add something of him or herself to their creation. Trekkers likewise interpret the landscape with their feet, their eyes, and all their senses, in ways that a camera or motor vehicle can never do. Besides, as Aristotle rightly said, walking with obstacles in one’s path is far more rewarding than walking across flat land, and it’s far less tiring! I recall a trek of several months through the coastal desert of Peru in which I was forced to stick to the highway for long periods because huge cliffs didn’t allow any alternative. How difficult and depressing it was! In contrast, after struggling (almost crawling) up gigantic sand dunes that swallowed my every step, I leapt about like a goat, rejoicing and reinvigorated by the sight of the new scenery that lay before me when I at last reached the crest. This is another trait shared by trekkers: we nourish and fortify ourselves by contemplating nature, that natural beauty greater than ourselves, that we cannot duplicate nor at times understand, and that, regardless of how many elements comprise it, is always in harmony. Such vast beauty often has the effect of making us feel very small, and feeling small is the first step toward seeing things as they are. Ay! How I cringe to see people strutting on treadmills in the gym, staring at a video screen. With Robert and Daisy you won’t embark on a disciplined exercise regime or strive for athletic goals, you’ll be riding on the shoulders of two dreamers, albeit dreamers with their feet firmly on the ground, who will lead you down paths and into corners from which the world can be better appreciated. As I said at the outset, it’s a question of experiencing the journey, of passage not arrival. 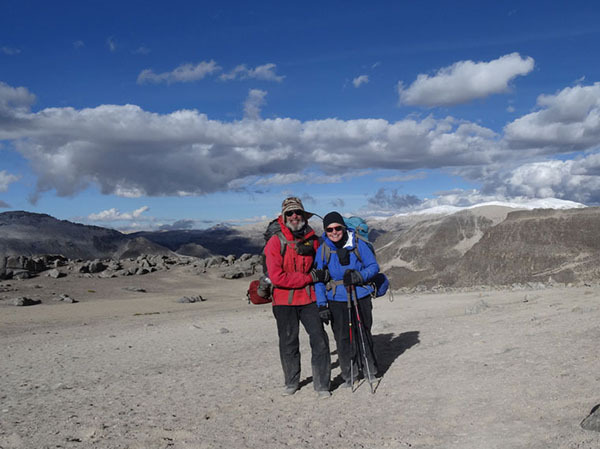 I have learned so much in the company of this remarkable pair of trekkers. Their frugality and their generosity, their good judgment, their gentle yet indomitable spirit, their noble hearts. Their respect for their fellow human beings no matter what their condition and their capacity to retain a curious child’s delight at all the surprises with which each new route presents them. They are a couple worth emulating. I am honoured and very happy that they have allowed me to write to their readers and express my admiration. Recuerdo lo que me dijo una vez con asombro una joven amiga italiana, citadina a ultranza, cuando paseábamos por la árida, pedregosa e inhóspita costa peruana: ¡Así de espectacular debe haber sido la Tierra antes de que el hombre la transformara! Jamás había pensado hasta entonces que había zonas del planeta que habían sido totalmente rediseñadas y, humanizadas, habían perdido su originalidad. Fue ese mismo desierto el que me había atraído desde niño, cuando viajaba adormecido, apoyado contra la ventana del auto en la carretera Panamericana, y me había hecho soñar repetidamente con caminar hacia las montañas y no detenerme jamás. Todavía sueño con ello. Pero sería imprudente pintar un paraíso. El Perú tiene mucho de tierra no tocada, virginal, que te incita a soñar y te invita a seguir y seguir, sin parar; pero también tiene muchos paisajes transformados, y no exactamente de manera armónica. En este país se dan cita los polos opuestos más que en ningún otro lugar. Uno no acaba de salir de una ciudad como Lima, con toda la belleza y la fealdad de una populosa urbe que pretende ser moderna, aunque agresiva y caótica, y ya está respirando la quietud de un pueblito serrano al que nadie le avisó que el siglo XVII terminó hace mucho. La maquinaria pesada que construye carreteras por doquier se detiene cada tanto para dejar que pase un pastor y sus animales, mientras cerca una mamacha le grita con voz aguda, en quechua, desde el interior de una combi, a su teléfono inteligente. El semáforo, rojo de impotencia porque no hay chofer de mototaxi que lo tome en cuenta, luce como una libélula atrapada en una telaraña de cables imposible de descifrar, en cada esquina. La tecnología se introdujo con velocidad irrespetuosa en un mundo anciano, ocasionando un choque en cadena que no termina de producirse. Sin embargo, hay otro Perú. El más grande, sin tiempo, ajeno al presente, y eterno. El país del desierto más seco, del mar más productivo, repleto de peces y aves, de las montañas nevadas tropicales más altas, de las campiñas de ensueño donde la gente aún trabaja la tierra de todos cantando y riendo, y de la jungla interminable infestada de vida bullendo en cada árbol, en cada hoja, en cada gota de agua. Y ese otro Perú lo conocen muy bien Robert y Daisy; mejor que nadie, diría yo. Su sorprendente perseverancia para sumar paso a paso, años de búsqueda y descubrimiento, los ha hecho dueños de un caudal de conocimiento sobre esta tierra que es un tesoro único y valiosísimo. Ellos no solo recorren el país; lo que hacen es dibujar y tejer una gran alfombra con sus andares, retratando de manera fiel y al mismo tiempo muy propia, todo lo que en él se encuentra. ¡Y qué resultado! A las habilidades para rastrear lo que realmente vale la pena conocer le suman una capacidad excepcional para relatarlo, dando las pautas precisas para disfrutarlo tanto como ellos y repetir su experiencia de manera integral. He tenido la suerte de caminar con ellos en algunas oportunidades, tanto en tramos largos y difíciles como en paseos de unas horas, y lo considero un regalo muy especial. Es un placer ver cómo se compenetran y complementan en las tareas propias del excursionismo y es aún más notable cuando te das cuenta de que ¡llevan toda una vida haciéndolo juntos! Para un viejo cascarrabias como yo, que prefiere ser temido como al “yeti” para que nadie se acerque, esto es doblemente admirable. La paciencia y la dedicación con la que recorren el continente (y el planeta) y registran todo lo encontrado, solo la tienen quienes aman lo que hacen. Y eso, creo, lo compartimos todos los que caminamos. ¿Quién se pondría a pintar un paisaje si puede fotografiarlo tan fácilmente? pues el que ama pintar y conoce las satisfacciones que produce, además de la posibilidad de agregarle algo de uno mismo y recrear lo que ve. Eso es caminar, a diferencia de trasladarse a algún lugar en cualquier vehículo, lo que uno hace es interpretar el paisaje con sus pies, con sus ojos y con todos los sentidos, viviendo cada detalle y cada momento como en una obra de arte. Además, debemos confesarlo junto con Aristóteles, el caminar con obstáculos es mucho más agradable que caminar sobre terreno plano, ¡y cansa menos! Recuerdo que en una caminata de varios meses por el desierto costero peruano estuve obligado en tramos largos a continuar por la carretera pues los enormes precipicios no dejaban otra opción. ¡Qué duro y deprimente fue! En cambio, trepando cuesta arriba, casi a rastras, por gigantescas dunas que se tragaban mis pasos, llegaba a la cima y empezaba a saltar como una cabra, feliz, con energías renovadas por la visión de los nuevos paisajes que me esperaban adelante. Esa es otra característica de los caminantes: nos alimentamos y recibimos nuestra fuerza principalmente de la contemplación de la naturaleza, de esa belleza natural que nos sobrepasa, que no podemos repetir y a veces ni entender, que no importando cuántos elementos tenga, siempre es armónica. Esa belleza gigantesca que suele tener el efecto de hacernos sentir muy pequeños, y sentirse pequeño es el primer paso para ver las cosas tal como son. ¡Ay! cuando veo gente caminando sobre fajas sin fin mientras ven una pantalla... se me encogen las tripas. Con Robert y Daisy no se montarán en un tren de ejercicios disciplinados ni de metas atléticas, se subirán a los hombros de dos soñadores -con ambos pies bien puestos en la tierra- que los llevarán por senderos y rincones desde donde el mundo se ve mejor. Como decía al principio, lo nuestro es pasar, no llegar. Es mucho lo que he aprendido de mi cercanía a esta dupla de caminantes tan singular. Su austeridad y su generosidad, su buen juicio, su espíritu manso pero indomable, su gran corazón. Su respeto por el prójimo sin importar su condición y su capacidad para seguir gozando como niños curiosos de las sorpresas que depara toda nueva ruta. Una pareja digna de imitar. Que hoy me hayan permitido escribirle a sus lectores y mostrarles mi admiración, es un gran honor que me ha hecho muy feliz. A well-known form of acknowledgment is to say that one has stood on the shoulders of giants. We have had the privilege of following their large strides and sure footsteps. Ricardo Espinosa provided endless valuable advice regarding trekking routes, reviewed various chapters, wrote the foreword, and always guided us with his enthusiasm and his example. Ben Box’s example as a professional guidebook writer, a true gentleman, and a scholar has likewise been guiding us for many years. Ben skillfully translated Ricardo's foreword into English. Also exemplary are our adoptive parents, Baruch and Aviva Aziza, enthusiastic campers into their eighties who watched over us and vicariously lived all our adventures in Peru. The example of soft-spoken kindness and generosity set by our very own gentle giant, the late Craig Kolthoff, will always be with us. We are grateful to the following specialists, who either contributed information or reviewed sections in their respective areas of expertise: César Abad (cartography and Sondondo), José Bareda (cartography), Chris Benway (Cordillera Blanca), Stephen Bezruchka (medicine), Richar Cáceres (Carabaya), Alberto and Aidé Cafferata (Cordillera Blanca and Sondondo), Paul Cripps (Cuzco), Rob Dover (Chachapoyas), Leo Duncan (Cuzco), Peter Frost (Cuzco), John Gorfinkel (medicine), Alex Guttman (medicine), Klaus Hartl (Arequipa), José Mestas (Puno), Justo Motta (Cotahuasi), Gustavo Reeves (Conchucos), Gustavo Rondón (Arequipa), Mark Smith (Cuzco), and Hernando Tavera (seismology). For their hospitality on and off the trail, we thank Nilda Aldoradín (Cabana), David and Alicia Aliaga (Isca Jaa), Eladio and Victoria Asencios (Sharco), Florencio and Edubiges Ayma (Perccaro), Roberto and Adelaida Barzola (Tingo), Ladislao and Hilda Bellota (Andahuaylillas), Wilson Benítez (Jacabamba), María Bolaños (Junuta), Catalina Borda (Cotahuasi), Otto Brun (Orurillo), José Cahuana (Siani), Wilgen and Norma Cajamarca, Efraín and Evelina Carrión (Yanatile), Isidro and Juana Ccanccapa (Chaccone), Santos Ccoa (Chaupicocha), Revelino Chávez (Hualcayán), Miguel Chayguaque (Cullicocha), Flavio and Yolanda Cobos (Huancacalle), Julián Cutipa (Aymaña), Raymundo Cuyo (Ccotaña), Saida Espinoza (Santa Rosa Baja), Orel and Zenayda Fernández (Otutupampa), Hilario and Hermelinda Figueroa (Huecroncocha), Pascual and Rosalvina Flores (Andamarca), Julián Gamarra (Huaccollo), Mario Hacho (Pacaje), Ciriaco Huamán (Racachaca), Epifania Huamán (Yanama), Nelson and Nelly Huamán (Cochabamba), Wilmer Huamán (Chuquibamba), Apolonio Jara (Morocancha), Aníbal and Elizabet Jiménez (Yanacancha), Valentín and Victoria Laucata (Hanccoyo), Irene Mallma (Sondondo), Rosa Mamani (Huancané Apacheta), Filomeno and Dina Medina (Soro), Ignacio and Claviana Mendoza (Ragrajpamba), Freddy Mollo (Chachas), Roberto Moncada (Cabanaconde), Máximo Pérez (Maucallacta), Hermenejildo and Viviana Pitanzo (Taucca), Juan and Epifanía Ramos (Hampatura), Valentín and Tomasa Saca (Maizal), Marcelino Santana (Yanaututo), Teófila Tantavilca (Tambo Real), César Totocayo (Puyca), René Urquizo (Chaupo), Neira Valladares (Acochaca), Juan Velázquez (Maucallacta), Manuel Zaumar (Atuén), Cristina Zinni (Vilcabamba), Teresa Zorrilla (Huaritambo), Alí and Marlene (Andagua), Ramiro and Janeth (Quechualla), Julio César and Virginia (Rosariopampa), Mechi and Jorge (Tarmatambo), Edwin, Hildebrant, and Filomena (Incapatacuna), Simeón and Martín (Upis), and Gavino, Roxana, and David (Chillca). Our special thanks to Darryl Booker, Julie Briselden, Web Chang, Kirsten Colton, Jane Crosen, Jen Grable, Lynn Greisz, Gayle Grything, McKenzie Long, Erika Lundahl, Mary Metz, Kate Rogers, Connie Saxon, Naomi Strom, and the entire team at Mountaineers Books; it is a pleasure to work with such skilled professionals. Others who helped in many different ways include Giraldo and Juana Aguirre, Manolo Alegría, Alex and Adán Ancalle, Dimitry Balberin, Carola Behrendt, Henry Blanco, Jean Brown, Carlos and Charo Burga, Gina Cáceres, Jorge and Wanda Cobos, Mariluz Covarrubias, Cayetano Crispín, Jean-Jacques Decoster, Rigoberto Delgado, Felipe Díaz, Yahira Echarri, Dolores Encalada, Nora Espinosa, Pedro and Lidia Flores, Wilfredo Flores, Grupos GEA Andagua y Cotahuasi, Evaristo Hancco, Kieron Heath, Michel Hediger, Jonathan Hollander, Rainer Hostnig, José and Lucía Hualca, Sixto Huamani, Leonidas Huisocayna, Emiliano Huizacayma, Bebel and Margarita Ibarra, Ernesto Jancco, Lou Jost, Henry Lares, Valentín and Victoria Laucata, Padre Lino, Pedro Lizarzaburu, Héctor López, Yonny López, Felipe Mayoría, Honorato Menéndez, Nenny Menéndez and family, Benita Merma, Juan and Dionisia Merma, Diana Morris, Marcelo and Grace Naranjo, Jesús Nolberto, Ali O’Neal, Vicente Paloma, Eudosia and Raul Peña, Juan Pérez, Walter Pérez, Gerardo Pinto, Michel Portier, Jesús Quispe, Ariel Ramírez, Froilan Ramos, William Reyes, Clímaco Romero, Francisco Romero, Boudewijn de Roover, Raúl Rosas, Pablo and Carolina Saavedra, Janeth Saliz, Ronal Salvador, Percy and Analía Sánchez, Marcos Sánchez, Waldo and Fabiola Sánchez, Cecilia de Sarfaty, Ella Smyth, Noemí Soto, Felipe Varela, Sandro Vilcape, Carlos Zárate, Teresa Zorrillo, Celso and Braulia, Felix and Petita, Fernando, and Gregoriana. Robert and Daisy Kunstaetter have trekked in Peru since 1987, but Daisy had begun hiking in the Andes of her native Ecuador long before, at age five when she promptly fell into a quebrada. Little did she know how many more quebradas lay ahead. Daisy’s trail eventually led her to Montreal, Canada, for university, where she met Robert and his idea of traveling for “a year or so.” Their training in medicine and occupational therapy had prepared them for a different set of challenges, so they continued their education at the National Outdoor Leadership School (NOLS), in Wyoming, USA, before hitting the road. The year proved to be elastic, and they have since traveled and trekked throughout Latin America, gradually acquiring the profession of travel writing along the way. 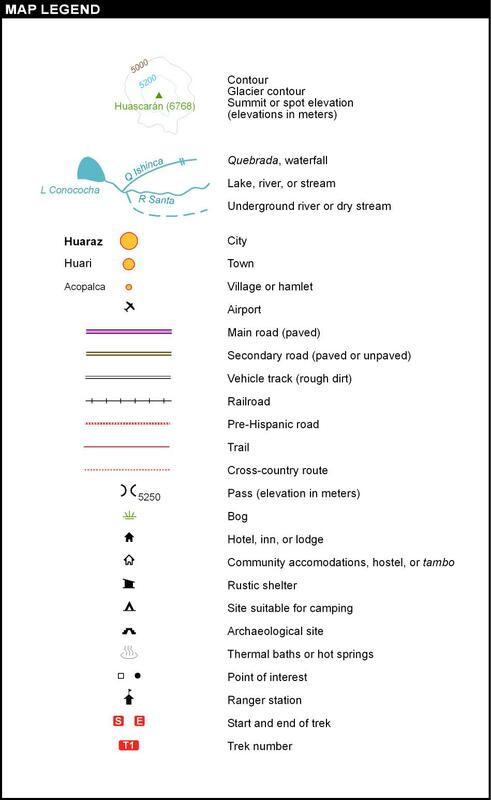 Since 1994 Robert and Daisy have been correspondents for annual editions of the South American Handbook and subsequently authors and cartographers of numerous travel guidebooks about Peru, Bolivia, and Ecuador. They are also authors of Trekking in Ecuador (Mountaineers Books). Notoriously leisurely on the trail, they might be found enjoying an after-lunch siesta in the sun or chatting with campesinos along the way. When asked “Who is your guide?”, they usually point to one another. For more infromation about us and our books, see www.journeywriters.com.